1 Bridal Bouquet: 5-6 Escimo roses, 3-5 cream spray roses, 5-6 white ranunculus, 3 white statice, heavy base of seeded euc, gunni euc, and baby green euc. 4-5 Bridesmaid Bouqets: 3-4 Escimo roses, 2 cream spray roses, 2-3 white ranunculus, 2-3 white statice, heavy base of seeded euc, gunni euc, and baby green euc. Bouts or Corsages: I average 1-2 spray rose buds per bout, and 3 buds per corsage. Add sprigs of statice and your favorite green! I like to save a ranunculus for the groom's bout to make his special! 10 Centerpieces, 5'' diameter: Green first with seeded euc, salal, gunni euc, and baby euc. Then add 4-5 Escimo roses, 2 cream spray roses, 2-3 statice stems, 2 white alstromeria, 2 white ranunculus . 20-25 Mason Jar or 3'' Vase: 2 Escimo roses, 1 cream spray rose, sprigs of statice, 1 astromeria, 1 ranunculus with greens. 50-60 Budvases: Each one will look different. I average 2-3 blooms per bud vase and a sprig of green. These are the flower allotted for budvases: 50 Escimo roses, 20 cream spray roses, 2 bunches of white statice, 20 stems of white alstromeria, 20 white ranunculus, 2 bu of seeded euc, 1 bu of salal, 2 bu gunni, 1 bu baby euc. 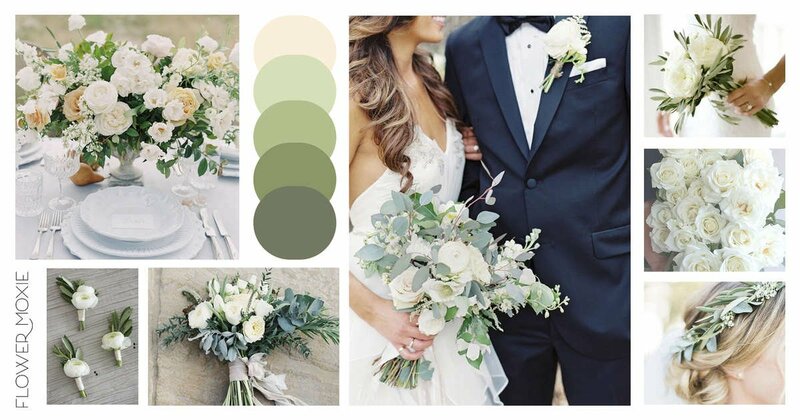 Here's our Cream and Sage Pinterest Board that inspired this combination of flowers. We hand-selected predictable and year-round flowers that will be easy to work with and give you the same or similar vibe that's happening within these moodboards to take the guess-work out of it!